T-shirt orders can now be placed below. Online ordering will be available until February 1, 2019. All orders will be available for pick-up at the registration table for Freezer Jam 2019. There are four colors to choose from in sizes S-3XL. Prices are $10.00 for short sleeve and $12.00 for long sleeve (DK Grey and Green only). ONLINE T-SHIRT ORDERS HAVE ENDED. We will have some T-shirts available at Freezer Jam registration. 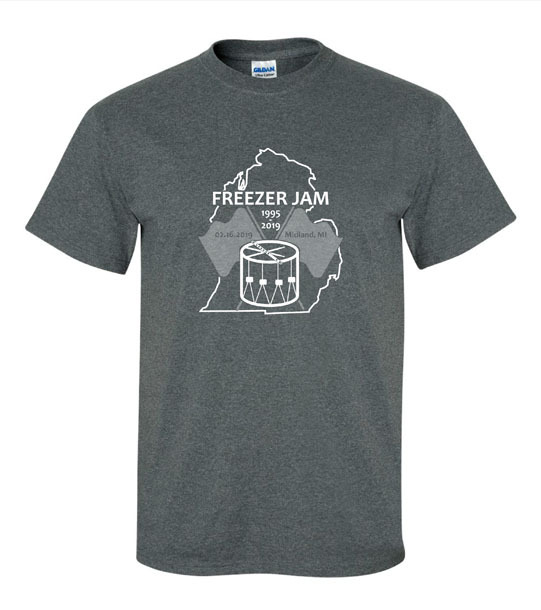 If you would like to reserve a shirt or have any questions please email the 2019 Freezer Jam committee at TVFJ2019@gmail.com.